Often when we talk about dynamic personalized creatives, discussion is limited to customized CTAs. But the potential of personalization extends far beyond this. The key to the perfect creative is to personalize every single element! App marketing is most successful when you harness the full potential of your data. Use all of the information available to you - including user location, language feed, favourite avatars, and previous behaviors - to dynamically compose a creative in real-time that will speak to each user on an individual level. Then watch as engagement skyrockets! 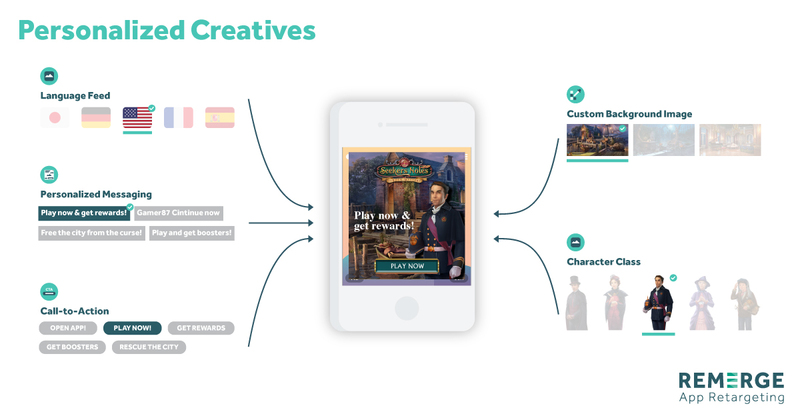 In this example of a gaming app, creatives can be composed featuring a user’s favored avatar and references to their precise position within the game. For e-commerce, you can display a product that a user has expressed interest in, along with enticing CTAs and specific information about the cost and availability of that product in any particular location. Personalized creatives enable you to speak directly to each user at an individual level, resulting in higher app-opens and engagement.